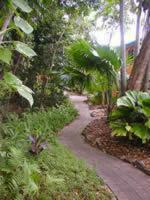 Rainforest Grove Holiday Resort, Cairns discount hotels and accommodation. Rainforest Grove Holiday Resort offers one & two bedroom apartments with the convenience of modern living with the natural splendour of a superb rainforest setting. Surrounded by tall palms and cool shady gardens, the swimming pool and large undercover barbecue area are very pleasant places to relax. Stream meanders through the rainforest and using one of the walkways - stop awhile and feed the fish and turtles. View photos, room descriptions and make online reservations at Rainforest Grove Holiday Resort. Save on room prices at Rainforest Grove Holiday Resort, Cairns.